Teamwork is a much required skill in the job market today. Most jobs nowadays require that employees work constructively in teams. 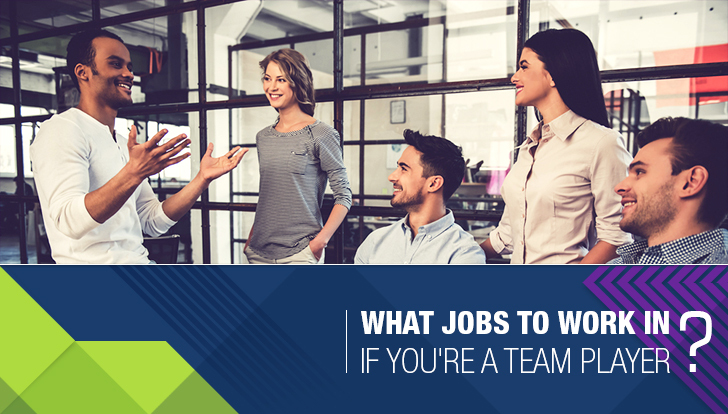 Working in teams is not for everyone; if you enjoy the company and like to cooperate with coworkers on projects, here are some jobs that you would likely enjoy. The process of recruiting and managing personnel is definitely not a solo job. Human resources employees are required to be “people persons”; meaning that they work well with others and enjoy interacting with people. Sharing information, following up on a teammate’s work or cooperating on a staffing project are some of the things that require teamwork in HR. Marketing and advertising for a business is a shared effort. Marketing employees share ideas, work together to formulate advertisements and collaborate on different promotional projects. The marketing department is the voice of any company; the most efficient means of communication with the company’s target market. For this reason, digital marketers, social media specialists and traditional marketers should work in tandem to unify the voice of the company. Interacting with customers face to face is not as easy as it sounds. Customer service reps are the face of the company; they represent the company, all its products and its reputation. More often than not, there is a rush in customer service centers. The customer service reps must efficiently communicate and cooperate to effectively satisfy all customers without any delay. This is definitely not a job for solitary workers. People think that the only skill you need to work in IT is good computer skills. This statement could not be further than the truth. People working in IT must cooperate in order to run the whole network of a company efficiently. The network and computer needs of a large company cannot be maintained by a sole professional, no matter how good he/she is with computers. Efficient delegation and collaboration is crucial in order to run a smooth networking experience for the company’s employees. Handling a company’s finances, there is no bigger responsibility. A single mistake could be the difference between a promotion and getting fired. People working in finance handle other employees’ salaries, companies’ profits and must keep records of all financial dealings. It’s a tough job, that’s why it’s best to share responsibility. A finance department handling too much responsibility is likely to make mistakes. This is why an efficient team with constant communication and shared responsibility is a must if you are going to work in this field. Think you have the teamwork skills to work in some of these jobs? The sense of cooperation creates a link between employees. Workers with good teamwork skills make the company run as efficiently as a machine. If you believe you can work as part of a team and cooperate efficiently with team members. Check out these jobs from Jobzella that will require you to work with others.